Anthony Bourdain, the self-proclaimed cranky, no holds bar, chain-smoking, and alcohol drinking host of, No Reservations, is on the road again. Unfortunately, for all you fans out there this is the 9th and final season for Bourdain. Fans have traveled with Bourdain through at least 60 countries such as, Vietnam, Paris, France, and Iceland as well as different cities in America. Travel Channel aired the season premier on Monday September 3 at 9pm ET/PT. 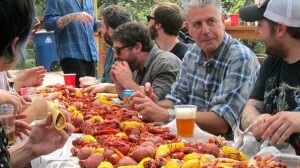 The first city on the list for Bourdain was Austin, Texas. Texas – the land of BBQ and Mexican dishes. Bourdain arrived during the South by Southwest Film and Music Festival, which is held every spring in Austin. Bourdain arrived to a party atmosphere where the line up was large and the music loud. You can say its Mardi Gras – Texas style. Where there is a festival there is great food. Bourdain definitely had his share of food and ate with some of the performing bands that travelled from all over the world to play at the festival. My favorite band Bourdain dined with is Sleigh Bells, an alternative/Indie duo who hails from Brooklyn. Not only is the band into good food, they have band members who can cook. The band prefers renting a house while on tour just so they can cook up feasts and enjoy a relaxing moment with friends. Who can resists a whole roasted pig, craw-daddies, and avocado margaritas? Bourdain also dined with Ume, Austin’s own trio band whose indie rock sounds are definitely loud but good. The band’s pint size lead vocalist and guitar player, Lauren Larson, impressed Bourdain with her music, and impressed him moreso when they were served fried chicken testicles. She didn’t blink an eye. The episode was entertaining and had a laid back feel to it. Bourdain goes around with the locals, feeds the bands, and gets the best of the best BBQ. The tie goes to Franklin BBQ, who has a line of customers that practically goes around the block from open to closing time. The Whiskey Shivers, a funky bluegrass band, swears by J. Mueller’s BBQ, another popular spot. The owner J. Mueller had hightailed it out of Austin for a while, but the city pulled him back. J. Mueller was gone, but definitely not forgotten. Bourdain’s time ends in Austin when the festival ends and everyone is packing up for home. The once filled streets are now deserted, but Austin residents aren’t worried. Austin’s motto, “let’s keep Austin weird”, is sure to bring more festivals and food experiences coming. No Reservations: The Final Tour does not disappoint. The food looked so delicious you wished Willie Wonka’s transferring machine worked and you could reach in the television and grab some grub for yourself. In other episodes, Boudain takes us viewers to cuisine and local culture from Ri de Janeiro, Burgundy, France, and Sydney, Australia. I hope you didn’t miss the last season. One more season to trot around the world with Anthony Bourdain. The final episode of “Anthony Bourdain: No Reservations – The Final Tour,” aired at 8 p.m. Monday, Nov. 5 on Travel Channel.